My friends, Angela and Kevin have been so gracious to allow me to photograph and show you around their wonderful home! Today we’re going to tour their master bedroom and bathroom. 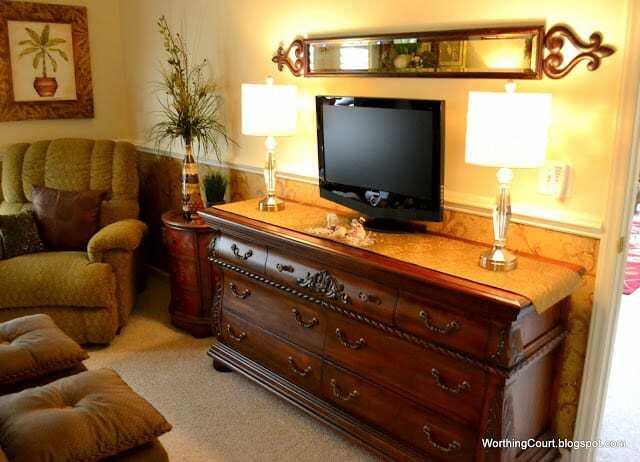 Angela has done a terrific job of creating a cozy, intimate bedroom for herself and Kevin. 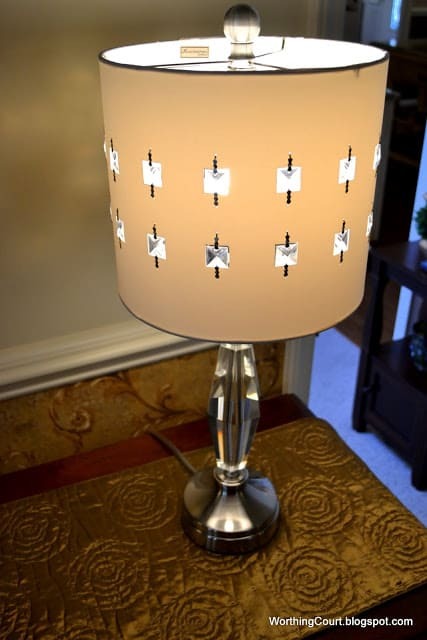 Here’s a closer look at one of the lamps on the dresser. I wanted you to see the pretty detail in the shades. 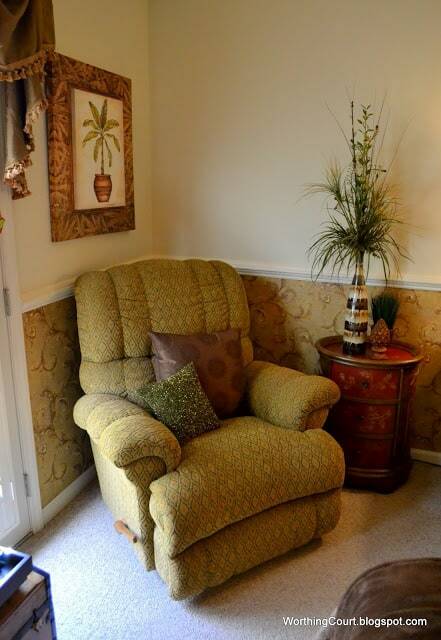 The rich colors certainly work to create a sense of coziness, but so does all of the texture that Angela has added. The bedding, the plantation shutters and window treatments, the wallpaper below the chair rail and the accessories all work so well together. I just love this squatty little lamp. 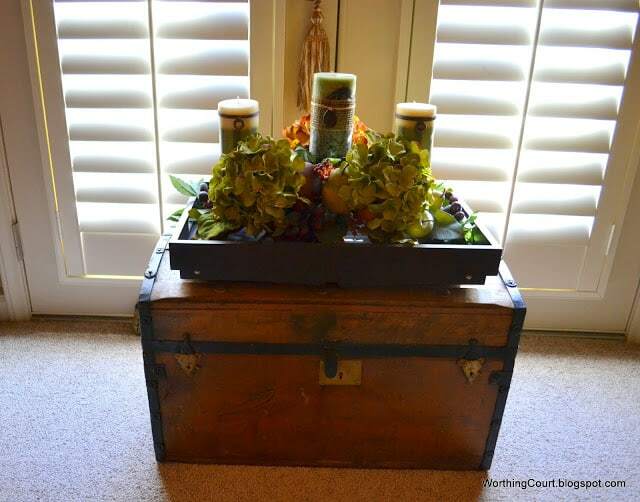 …with this trunk and pretty vignette beside it. Behind the trunk are french doors they added to give them access to the deck. 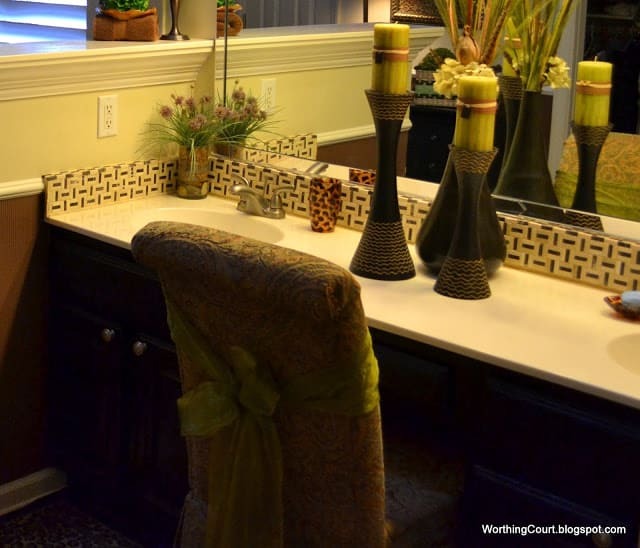 As soon as you enter the bathroom, you’re greeted by this pretty sink and dressing area. Angela and Kevin painted the original oak cabinets and added the backsplash themselves. 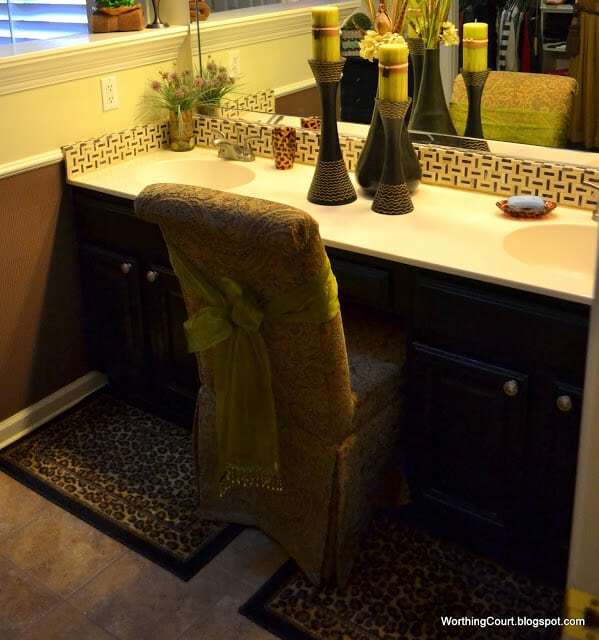 One more look at the vanity area just because I’m so in love with the colors and all of the pattern that she used! 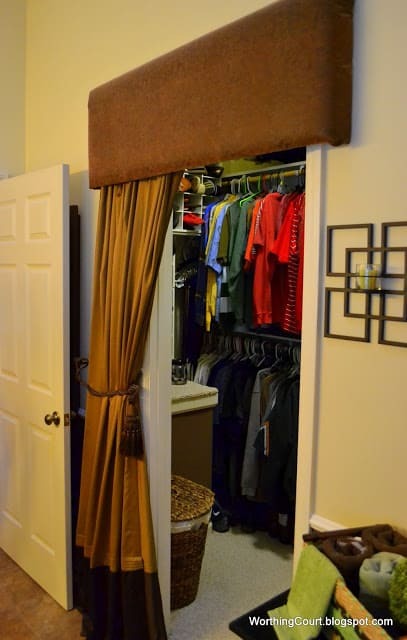 The entrance to the closet is directly behind the vanity. They removed the closet door because it took up quite a bit of floor space in their bathroom when it was opened. It was with a cornice and drapery panel. 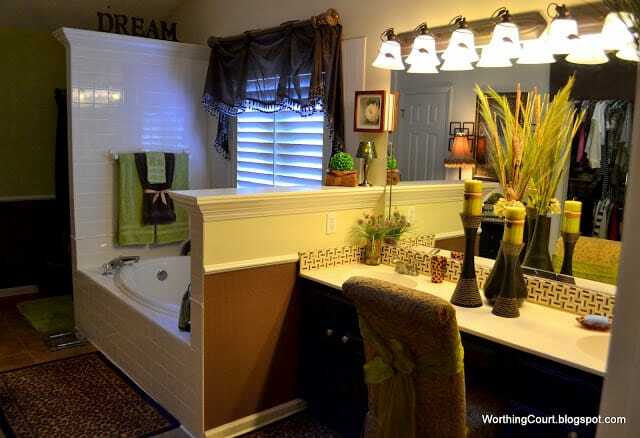 The tub area is surrounded with pretty towels and accessories. 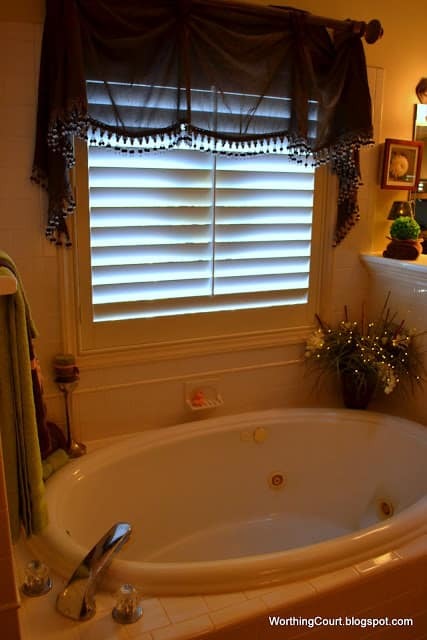 And this pretty chest sporting a cute basket sits across from the tub. Guess you can tell that these pictures were taken during Christmas! 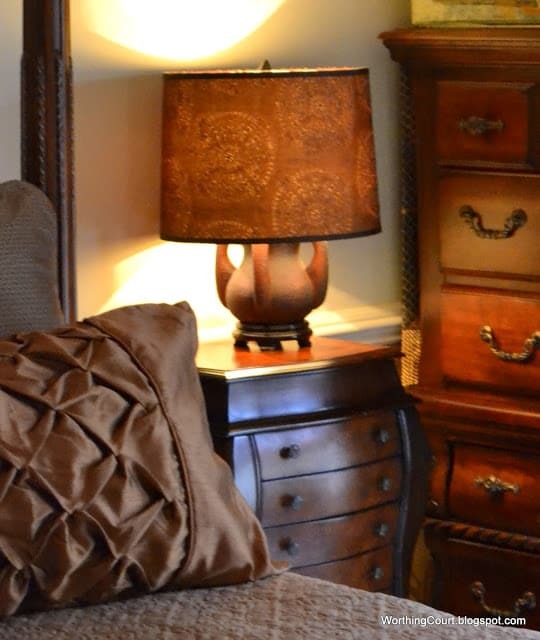 I just love Angela and Kevin’s home and hope you’ve enjoyed seeing their master suite! If you missed previous tours of their home, you can see the Christmas decor here, the fireplace makeover here, the laundry room here and their fabulous diy kitchen here. They have a beautiful home. Beaautiful Suzy!…can’t wait to see the rest of the tour!! Beautiful master suite. Thanks so much for sharing Angela and Kevin’s space. Wow! The bedroom and master bath have a tropical feel. I loved seeing all the texture and animal print. Thanks for sharing your friends beautiful home. You said it all warm and cozy. Love the color combination and the texture. My fav had to be the entrance to the closet. Really beautiful, cozy and warm master suit of your friends. I love the color thrughout. Lovely. Thank you for sharing. Have a nice week. I’m at Cozy Home Party too. What a lovely master suite. When I look at this I know I need to take some serious action in my bedroom! It really is beautiful! I love all of the warm colors and then using the lime green really makes it pop! 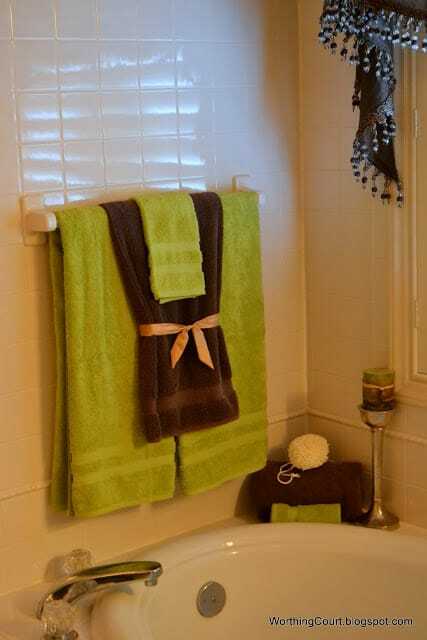 I need to make my towels look pretty like that! Just incredible, Suzy! They have a beautiful home! What a beautiful bedroom and bathroom! So elegant!!! Very beautiful bedroom and bathroom , Warm and inviting. Thanks for sharing. Love your style, looks so cozy and inviting. So very pretty! Love the color combo! She did a great job decorating! So cozy and pretty! I thoroughly enjoyed your post! Beautiful Home! Thanks so much for sharing! And thanks to your friends! I loved it! 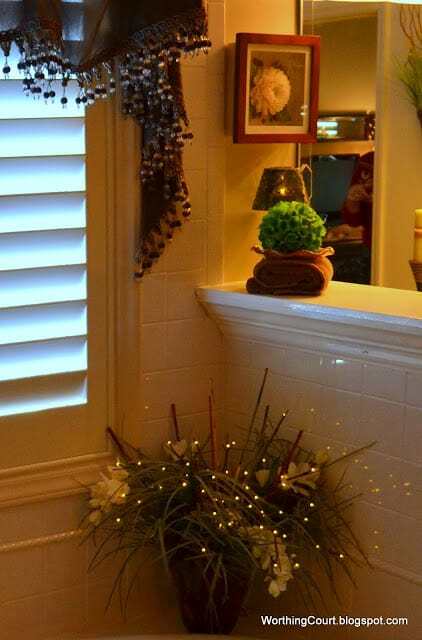 And I actually got some ideas for our master bath! Great post! Oh my, it’s stunning, simply stunning!! Truly a beautiful and comforting home. Wish I could see every nook and cranny. Very, very pretty! I’m a lover of animal prints myself. 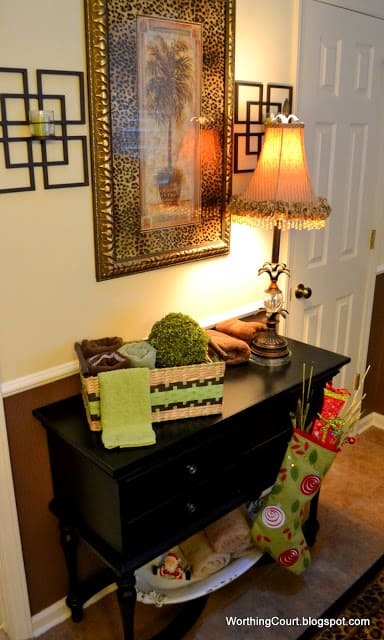 A lovely space–and so nice and CLEAN! 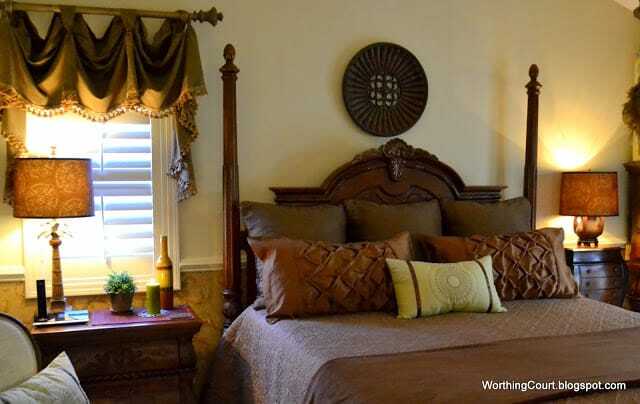 What a restful spot, just the way a master bedroom should be! 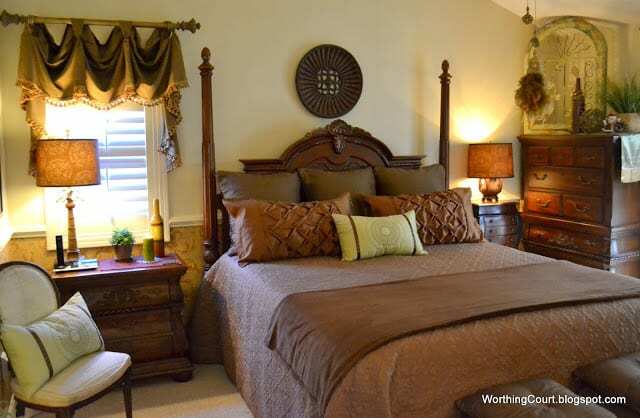 What a beautiful master suite! Thanks so much for sharing this with us at Inspiration Friday this week! Hi Suzy! I know I commented before. Just dropping by today to let you know I featured this post on my blog today. Hope you’re having a great weekend! 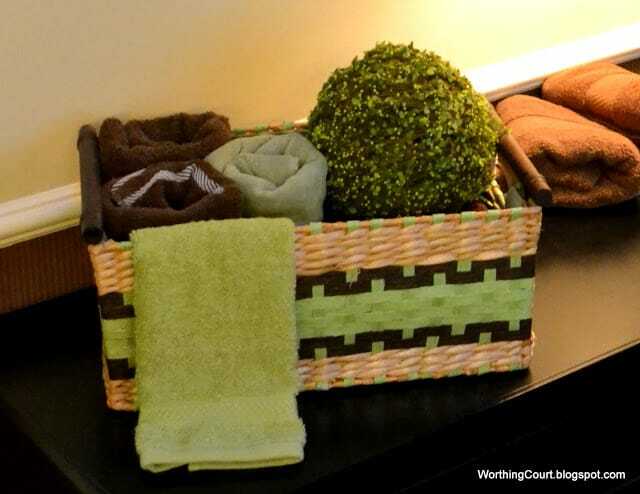 So beautiful, can you tell me where can I get a basket like that.